Made-to-measure is even more important in wheelchair sports than it is in regular sports, according to researcher Rienk van der Slikke. The interaction between athlete, wheelchair and sport is an important factor for the performance in wheelchair sport. The wheelchair acts as an extension of the athlete and needs to be included when monitoring performance, but it also has its own characteristics that influence performance. Unravelling the interaction between wheelchair, athlete and sport is not only valuable for wheelchair sports in general, but also helps the individual athlete in their attempts to improve their performance and prevent injury through overexertion. That is why Van der Slikke developed a technique that uses small sensors to measure the individual wheelchair performance. The Wheelchair Mobility Performance Monitor was designed to measure wheelchair activities easily and objectively. The method has subsequently been applied by various wheelchair athletes of different skill levels, under various conditions and with three different wheelchair sports (tennis, rugby and basketball). 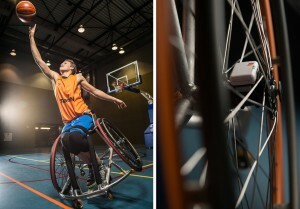 Van der Slikke has measured the best teams in wheelchair basketball and top international athletes during the ABNAMRO-tennis tournament in 2017. The measurements give insight in the relationship between the physical limitations of the athlete and their performance, the relationship between training and competition, the relationship between wheelchair configuration and performance and in the differences in performance between wheelchair sports. The information is helpful for the wheelchair sports to become more professional, because it gives a foundation to improve the rules, to make the sports as fair as possible. In addition, the results are usable by coaches and individual athletes to give a better view of their own performance and attempt to improve that by introducing different training techniques or better wheelchair configurations. The knowledge that has been acquired is also very applicable for wheelchair users during their daily lives. Insight into the physical exertion and stamina while using a wheelchair can help the rehabilitation process. Ultimately, every wheelchair user should be able to measure their own performance easily. Rienk van der Slikke received his doctorate on 25 May 2018 in this subject.